Mauna Kea High Bluffs Private Home. Cleaning Fee Included! Mauna Kea Resort. High Bluffs. 4 Bedroom home. Ocean Views, Private Swimming Pool. Cleaning Fee Included. Mauna Kea High Bluffs Private Home is set in a commanding position with beautiful views of the Hawaiian ocean. Located in one of the most desirable and well-known resorts in Hawaii, the Mauna Kea Resort is home to world class beaches and golf courses. A tremendous retreat for family and friends, this villa is sprawled out over 4,500 square feet and features four bedrooms, four full plus one half bathrooms and accommodates up to eight guests. The design and décor is fresh and relaxing in the living room that offers a large flat screen TV and comfortable furnishings. Open and inviting, the great room flows into the dining room and kitchen making entertaining a breeze. The gourmet kitchen is every chefs dream and features Thermador appliances and a center-island breakfast bar with seats for six. The indoor and outdoor dining areas have seats for eight. Two master bedroom suites feature sliding doors leading to the pool area, ocean views, indoor and outdoor showers, a freestanding deep soaking bathtub, double vanities, flat screen TV, and a cozy king-size bed. Two guest suites each have private bathrooms and walk-in showers. There are two twin beds that can be converted to a split king-size bed upon request and slider doors leading to the yard. The large patio connects guests to the spectacular views of the ocean and features a private saltwater heated pool and hot tub for year-round enjoyment. Please note that the pool does not have a safety fence or safety alarm. Please note that the pool is heated and temperature controlled to 82 degrees and the hot tub is heated and temperature controlled to 100 degrees. 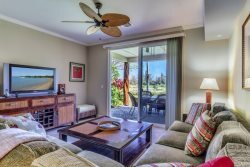 Guests have option to add on the Mauna Kea Gold Membership and Hapuna Hotel amenity access program for additional fees ($125 per day, per house). Please inquire on details. At least, two weeks advance notice/registration required to participate in this benefit. Inquire about our concierge services for dinning and golf reservations, activities and grocery shopping. Due to property and association by-laws the maximum occupancy listed is the maximum occupancy that is allowed in the property regardless of age of the guests. House Rules: Yes, there are House Rules. Basics are; Quiet hours from 10pm- 8 am, no parties, no smoking, no articles of clothing or beach gear on lanai, no glass at the pool. If you have specific questions or concerns, please ask. The complete condensed rules are posted in each unit. Please note that between Feb 24-28, 2018 the amenity services and access will be limited.